“The children enjoyed this explorative journey through the Latin American countries in which the story telling was brought to life with music, actions and props, not to mention very engaging and energetic work shop facilitators. The pitch was adapted to meet the needs of the children and everyone (adults and children alike) thoroughly and enjoyed themselves and want to know when we can do it again! Alejandro, the facilitator : skilled at working with the children and brought the workshop alive with his knowledge of dance. A pleasure to work with. “Very organized and friendly to work with. María was responsive and patient while planning and organizing the day, adapting the resources and programme specifically to our needs. The musicians and dancers were first class and work extremely well with our 12 and 13 yr old pupils, talking to them in an appropriate manner so that teachers were able to take a back seat role and manage the other aspects of the day. The performance was first rate! Impressive dancing, music, guitar playing and singing – a true flamenco show! Fantastic resources. Being able to choose which language to produce the dossiers and presentation in is perfect and adaptable”. “We thought it was really good and very well organised by Maria. It was great that they changed the classroom into a restaurant and all the resources were fantastic. Maybe keeping the session to thirty minutes maximum. Emily – Reception teacher – Bute House School. ( Healthy Food & Cooking Tapas workshop , 22 Reception children).. The lively and fun approach in the workshop has left a very pleasant memory with our pupils. They did enjoy the opportunity to act out and be involved. The props were lovely! “The workshop was highly engaging and really helped the students to learn Spanish, about culture, geography and also dance. They took away some great memories from the session as well as developing their listening, teamwork and creative thinking. Mar, the storyteller, was an enthusiastic and highly engaging professional. She inspired the children with her energy and positivity and also was well-prepared throughout the session”. Muy dinámicos e interesantes desde el punto de vista cultural. Las niñas se lo pasaron genial y aún hoy recuerdan el pañuelo como su juego favorito en español. Estuvo bien que María me preguntara con antelación si quería que hiciese alguno en particular, yo creo que eso es indispensable. ‘Thank you for the amazing Flamenco workshop! Overall I enjoyed the flamenco workshop; it was really good to do something completely different from normal lessons. My favourite part was the session with the cajón, it was great fun! Thank you for organising the event. I have really enjoyed the flamenco experience as I have never done any of it before. I learned a lot from this workshop and has inspired me to do more in the future. I found the time we had to learn the different bits was too short. However I loved the performance at lunchtime and I recommend this to everyone. I enjoyed the flamenco workshop due to the activities we did. Now, I have understood Spanish culture. 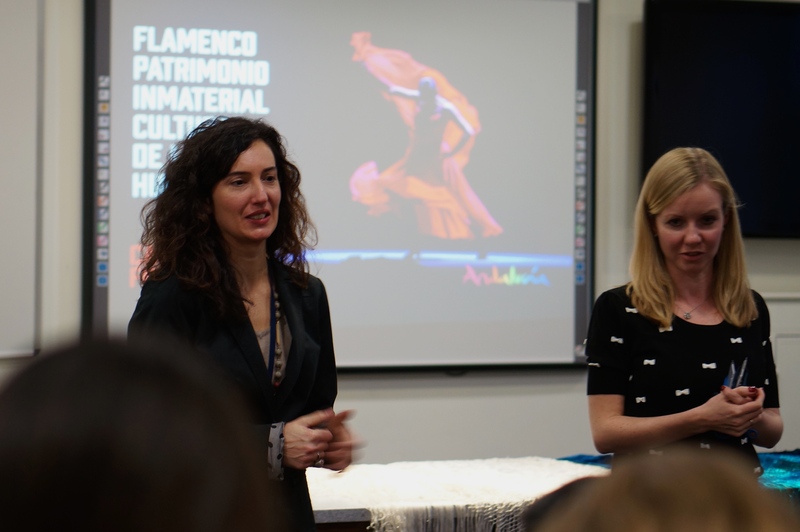 I really enjoyed the Flamenco workshop because it showed us the culture of Spain and showed me things that I didn’t know about. I think that, to make it even better, the girls and boys could be split up and could learn a different dance, which you could then share at the end. But, I think you should keep the cajón drumming and the history part as they were also very enjoyable and interesting. It may be quite hard to do all of this as it would mean you would need more places to rehearse and play in. Thank you very much for the opportunity, it was a great experience.